Vainly looking at my blog statistics (both in vanity and in futility), I noticed quite a lot of hits from web site called PlagScan, a plagiarism detection tool. Had someone been scanning me for plagiarism I wondered. Well, scan away. I don’t pinch other people’s stuff. Or do I? 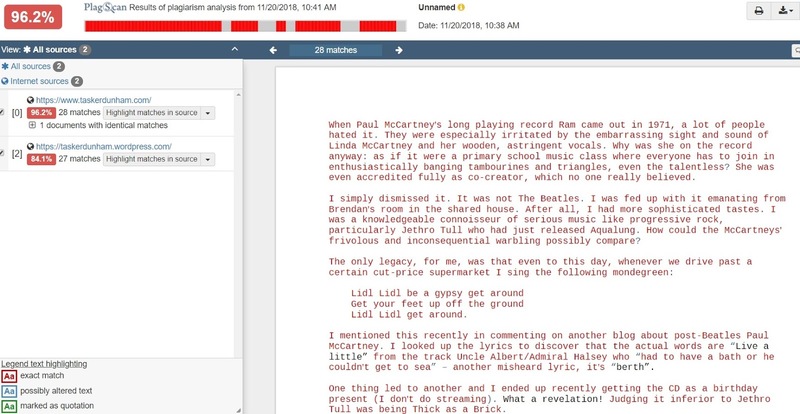 I went on to PlagScan (what an ugly name), uploaded the text of my post about Paul McCartney’s Ram L.P. and clicked ‘>Check’. The result: 96.2% plagiarism! What? How can that be? Of course! It had checked the uploaded text against my blog so it was bound to find close matches. Checking the actual blog page rather than the text upload, and disregarding all the matches against recurring items on my own and other Blogger blogs (e.g. lists of blog archive dates), brought the score down almost to zero. I say “almost” because apparently my use of the phrase “One thing led to another” is plagiarised from the text of Isaac Asimov’s sci-fi novel Galaxy. Thanks, Isaac. There are many other checkers on the web too, some free, some usage limited, some pay only. Some of the free ones are so useless they detected hardly any problems at all with my text, not even against my own blog. The expensive ones say “Significant Plagiarism Detected” and then wait to detect your significant payment before they give you the details. Plagiarism has clearly become big business since colleges and universities started to worry about students passing off others’ work as their own. Unscrupulous students had been getting away with it for years, but it was becoming an epidemic. At one time they preferred to pretend it didn’t happen. When I spotted it in my first lecturing job in 1985, they ignored it. A student had submitted an entire 5,000-word magazine article as his final-year Higher National Diploma dissertation. Unluckily for him, I had read just about everything there was on the topic because I was doing a Ph.D. in the area. Never underestimate how much university lecturers know about their specialist interests. With almost any other marker he would have got clean away with it. However, the course leader, a senior member of staff, regarded it as more of a nuisance for him than for the student. Placing expediency before inconvenience he said: “Give it a merit rather than a distinction on the ground that it relies too heavily on a limited number of sources,” and added, “and perhaps it would be best if you were absent from the examiners’ meeting.” Which is what I did, complicit in academic dishonesty, glad of the extra day to spend on the Ph.D., an unforgivable failure of integrity. Shouldn’t the student have failed his project, if not the whole course? I think back to a girl at school in the nineteen-sixties caught with an aide-mémoire during a G.C.E. exam. Not only was she penalised in that exam, the Examination Board barred her in all subjects and she left in disgrace. That’s how severely cheating used to be dealt with. As more and more instances emerged, universities began to develop plagiarism policies and procedures. Some managers built good careers out of it. When I came across another plagiarised project fifteen years after the first there was plenty of guidance about what to do. Within a year or two, such shameless, extensive plagiarism became impossible. 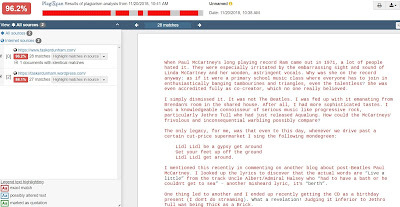 Universities turned from handwritten to electronic submission and bought in powerful systems such as Turnitin to identify chunks of text taken from elsewhere. Students knew for certain it would be spotted. They could even use the systems themselves to check they had not inadvertently broken the rules (or to find ways to get round them). It did not prevent one strange case I know when an external examiner accused a student of plagiarism during a handwritten, invigilated examination. The student’s answers contained paragraphs from a textbook written by the examiner herself. Strictly this was plagiarism, but the very nature of an examination is that answers may contain unattributed content, such as when a student cannot remember where it came from. And it is not unknown for some students to consign whole passages of text to memory. That is what the student had done here. She was still able to recite the passages later. She got a good mark. To one who came to computing when we had to code our own database search and compression functions, plagiarism checkers are impressive. The speed with which they trawl through petabytes of documents to find a single phrase is nothing short of miraculous. The latest versions can even check individual writing styles to identify third-party and contract cheating where students submit work written to order by others, such as essay mills. I suppose you could still get away with paying someone else to write an essay for you and then rewriting it in your own style. Or even using artificial intelligence in article spinners such as WordAI to do it for you. It’s not as bad as Dan Brown who got away with using others’ ideas in The Da Vinci Code because, as the judges put it, he had used only “generalised or other unprotectable ideas” that were “of too low a level of abstraction to be capable of protection by copyright law”. And certainly nothing like Roots whose author Alex Haley had to fork out $650,000 for plagiarising ideas from a novel called The African. Do we stand on the shoulders of giants, or is it, as T. S. Eliot said: “good writers borrow, great writers steal”? Now, where did I read all that? * I do not believe many students want to have to cheat in this way, and its occurrence might indicate inadequate supervision or care. There were a lot of background issues in the second case, so possibly the final outcome was fair, but the student in the first case was extremely fortunate to get away with it. Thank you. But how can people be sure that your plagiarism checker (links in comments are disabled on this blog) is genuine?